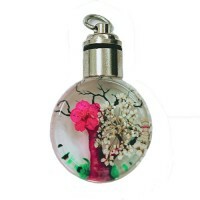 A single dried flower glass pendant with silver colour cap and jump ring in Green colour. Approximately 25 x 35mm in size and in an oval shape. Available in a choice of other colours.